SAP’s Asset Intelligence Network (AIN) is one of the application included in SAP Leonardo IoT portfolio’s Connected Assets pillar. SAP Leonardo is the new umbrella brand for SAP innovations focusing on digital business transformations, and it is basically a collection of software and services which can be used by organizations to develop digital transformation applications, thus empowers business by connecting the emerging world of intelligent devices with people and processes to achieve real business outcomes. Though SAP introduced it as a brand for its IoT applications, they also brought other next-generation technologies like artificial intelligence (AI), machine learning (ML), big data, advanced analytics and blockchain under the SAP Leonardo portfolio. SAP has identified that majority of the digital transformation projects by their customers are involved with more technologies than IoT, and this resulted in the rebranding to SAP Leonardo. SAP’s goal here is to provide structure and SAP Leonardo IoT combines adaptive applications with device management and connectivity across lines of business and industry use cases, ranging from products, assets, infrastructures, vehicle fleets, markets, and people. So let’s take a look at each of these pillars in brief. Connected Products – provides end-to-end visibility into product-centric operations. Connected Assets – links production systems and assets with manufacturing and maintenance business processes to reduce operational and maintenance costs and increase asset uptime. Connected Fleets – tracking, monitoring, analyzing, and maintaining all the moving assets wherever they are. Connected Infrastructure – delivers new forms of digital operational intelligence to transform physical infrastructure systems to allow for more efficient operations and enable better infrastructure compliance. Connected Markets – designed to help cities and rural areas optimize the utilization of natural resources and assets, so that reduces emissions, congestion, and energy usage, and improves the environment. Connected People – enables improved lives, work, and health by linking people. Other components in the portfolio are: SAP Leonardo Bridge – combines real-time information from connected things with business processes, SAP Leonardo Foundation – enables anyone to rapidly build Internet of Things applications, SAP Leonardo Edge – solution for collecting and processing IoT sensor data where it occurs(edge computing), rather than always sending it back to the core system. In this blog, we are focusing on SAP Asset Intelligence Network (AIN). ALL IMAGES ARE COURTESY OF SAP and property of SAP. 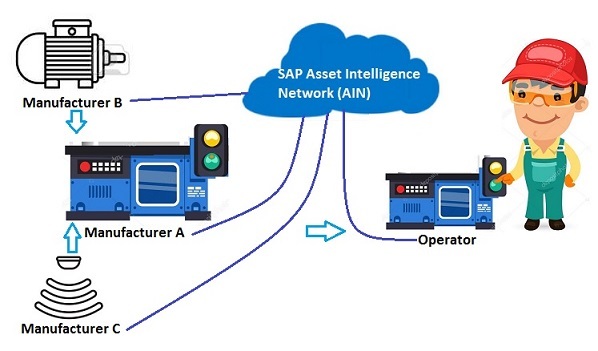 SAP’s Asset Intelligence Network (AIN) is one of the application included in SAP Leonardo IoT portfolio’s Connected Assets pillar, and it is a secure cloud-based information exchange for equipment manufacturers, operators and maintenance providers in asset-intensive industries. Organizations manage thousands of assets to keep their plants operational which include machinery, equipment and the associated spare parts. Better pooling and sharing of all up-to-date asset-related content is one of the key problem faced by organizations. Timely maintenance is required to ensure the plant’s equipment and machinery is working at an optimum level and this puts hectic pressure on maintenance managers working in process industries or in Procurement, Engineering, and Construction (EPC) companies. Maintenance can be a difficult challenge, due to heterogeneous systems, or missing or incomplete operators’ manuals, drawings and other information. SAP AIN is meant to solve the above issues. 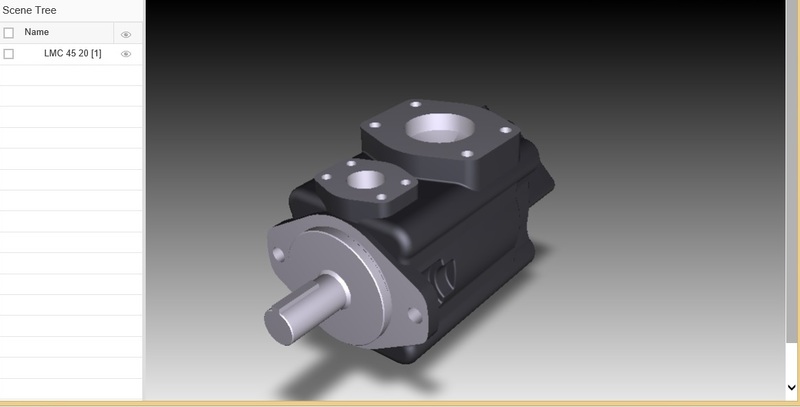 Imagine we have three manufacturers: – manufacturer C providing a motor and manufacturer B providing a sensor to a bigger manufacturer producing and manufacturing compressors. Once they ship those parts to manufacturer A, they extract the data(component specifications, user manual, service manual, etc) from their back-end systems and send it to manufacturer A, either as booklets, email, Fax, other semi-automatic and digital documentation, etc. Manufacturer A, in turn, usually has a whole department receiving the data and putting it into their back-end systems, where they store all the data of their assets and also the supplied parts and components from other manufacturers. In the end, once the compressor is done and manufactured, it’s shipped to the operator, and with the asset itself, also documentation will be shipped to the operator. The operator – if it’s a big operator – has a back-end system as well, and one of those back-end systems might be a maintenance system in order to maintain the asset and keep it alive. In order to do those maintenance activities, the operator usually needs data from the supplier, like data on how to maintain the asset, data on what the asset is all about, specifics like dimensions, size and everything you need to maintain the asset properly. This data, as mentioned, comes in a semi-digital way – letters, e-mails – and is then put by one of the colleagues at the operating company into the back-end system. All of those steps are not integrated. So we always have someone pulling data from somewhere and sending it to someone else. This produces a lot of effort, and quality gets lost throughout the supply chain. So in the end, what arrives at the operator might not be the best data you could get, and if the operator does not put effort into maintaining that data in his back end, he might risk running into problems later on when maintaining the asset. And this is the handover stage when the asset is shipped to the operator. Even once it has arrived at the operator, we face a lot of problems and struggles, with the master data and also with transactional data which you need to assess what already happened to an asset. Usually different departments work on each of phases of an asset lifecycle. So maybe the commissioning, the installation of an asset is done by one team and the maintenance is done by other teams, and sometimes they don’t talk to each other. And even more importantly, the systems they each use are different. So the documentation might reside in different systems, and they might even be redundant in some systems. So this is one problem the operator faces throughout the asset lifecycle. Another problem is regarding the updates of documents. The update of documents is a big challenge for operating companies, to get the most upto- date data, and then finding the old data points to replace them with the new ones. To summarize, we have the challenges. First, non-integrated systems, manual effort to extract the data to send it to someone else and put it there back in their systems. The second problem is that we have that vast variety of systems within a company, whether it’s the operating company or a service- providing company. The other one is to get the most upto – date documents. SAP Asset Intelligence Network aims to get rid of all this challenges and introduce one platform so that every asset in the world is residing on our SAP Asset Intelligence Network platform. 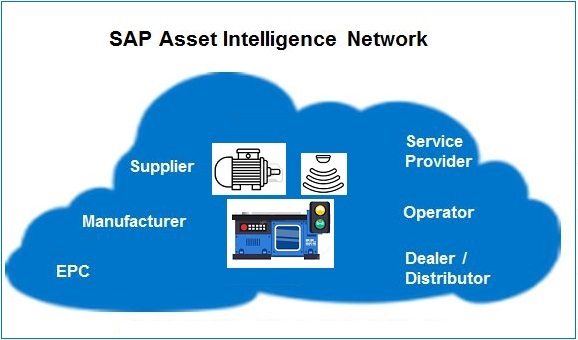 SAP’s Asset Intelligence Network is a cloud-based platform for secured information exchange between various roles in asset-intensive industries, like equipment manufacturers, operators, maintenance providers, etc. So here, in our example, the compressor – or what we call the digital twin of the compressor – would reside in SAP AIN, as well as all the components of that compressor. The advantage of this is that the sub suppliers – manufacturer C and manufacturer B – can provide that information directly to AIN. Manufacturer A only needs to provide information about that bigger asset, the compressor as such. The components – the sensor and the motor or the engine – the data to those two components will still be made available by manufacturer C and manufacturer B. And they only need to integrate to one system. So manufacturer B don’t have to integrate to each and every manufacturer system anymore, each of their customer systems. So it’s one platform where all of their customers are located. Then, on the other side, the operator’s side, they can now finally connect their back-end system to only one platform. Before that, it was hardly possible because each and every manufacturer or supplier in that case had their own manufacturer portal. Connecting to a thousand manufacturer portals was not efficient, and that’s the reason why no-one did it and why there’s still so much manual effort required. So now operating companies can connect their back-end systems to our SAP AIN and fetch the data directly into their systems in order to execute maintenance activities, in order to get an insight into the data of an asset, and also transactional data. Content: SAP AIN provides unique identification to each customer’s assets, as well as provisions to maintain associated details, such as warranties and maintenance schedules, in order to maintain uniformity, completeness and correctness of the customer’s assets. The service providers could use this information availability to align their manpower and spare parts that are required to perform maintenance. Network: Brings together OEMs, asset operators and service providers into a collaborative platform to share feedback on an asset’s performance, overall equipment efficiency and best practices for maintenance procedures to prolong an asset’s life. Applications: A platform which allows the OEM maintain the asset’s latest information regarding spare parts, including drawings and maintenance plans. By moving away from reactive maintenance to a predictive maintenance approach, SAP has come a long way in maintenance management. Constant streaming of an asset’s working conditions to AIN through sensors and other data transfer technology is required for predictive maintenance approach. Using the data available on an asset’s condition, the system can make suggestions like – when the next maintenance is due, and can align resources, such as manpower required from service providers or spare parts’ availability. Integration: At the core of SAP Asset Intelligence Network is SAP HANA Cloud Platform with IoT application services, and it can easily facilitate an asset’s maintenance data transfer directly from the asset to AIN and shares the data with AIN stakeholders. What AIN aims to provide is a single and central secure-cloud repository where OEMs (original equipment manufacturer), equipment operators and those firms which maintain that equipment can input or access all the latest information about the equipment they manufacture, use or service regardless of that content’s format. Using AIN, a manufacturer could make available all the content about each of its products, including manuals and maintenance recommendations. 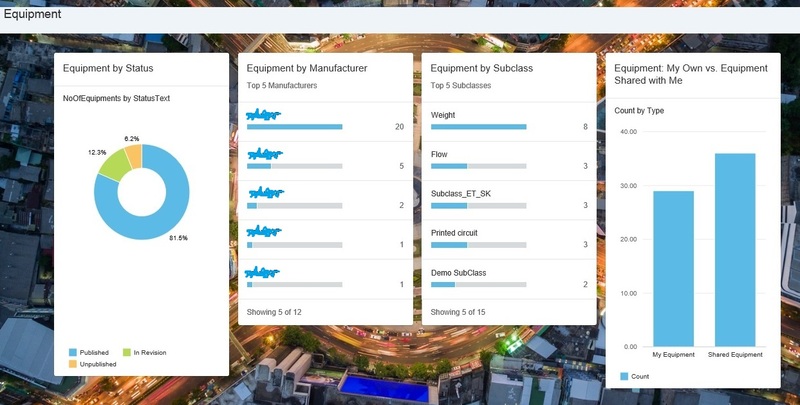 An equipment operator could then readily access any of that data as well as contribute updates on the particular configurations it’s using (via data from SAP ERP and Enterprise Asset Management) as well as real-time information from the equipment itself (through data from smart sensors attached to the equipment—think Internet of Things). 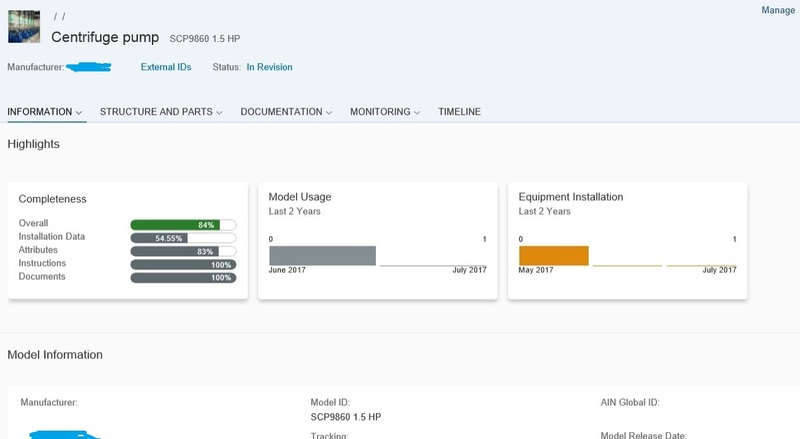 In conjunction with products like SAP Predictive Maintenance and Service (SAP PM&S) or SAP Connected Goods, we can display the data in SAP AIN and not only make it available for that one customer who owns those systems and products, but also to other stakeholders like service providers of this customer, in order for them to have a better insight to action when it comes to those assets. Another point here: It’s not only about having all the assets on one platform, in one cloud. It’s also about having the same structure for each asset. So no matter who produces a compressor, the operator will find a subset of data to be identical. So if they have two or three compressors from two or three different manufacturers, they will find a subset of data which is identical, and that makes it easier for them to compare and really make an informed decision on which compressor to use for which situation. So that’s the first part of putting the asset as such, the object into AIN. The second part is to have one single point of entry, an access point of entry to all the information. So here, throughout the lifecycle within an operating company, we want to either persist all the data in AIN, and here we mainly talk about master data, documentation, and so on, or we want to create a pointer to that information. Especially when we talk about transactional data, work orders – so someone performing work on an asset – we want to make it transparent here in Or sensor data so that you can really have a look at your health status for that asset in AIN using other products like PM&S and Connected Goods. So AIN want to be the single point of entry and the single point of truth for that asset, no matter who’s contributing data. As of now, we only talked about manufacturer and operator. There are lots of other roles, the most obvious and prominent role being the role of the service provider. So here it’s especially important for that service provider to know all the asset data, which might not have been the case before because they had their own system where they maintained their own work orders and activities they performed on the asset, and the operator might have another system. Now we can bring both these systems together and create one unified view on that asset. Since AIN is built on top of SAP Cloud Platform, we can go ahead and create our own extension, or an entirely new application which is using and consuming AIN data and might connect to other systems to enrich that data with our data. AIN is now generally available and will receive quarterly updates of new functionality based in part on early adopters’ feedback on future use cases. 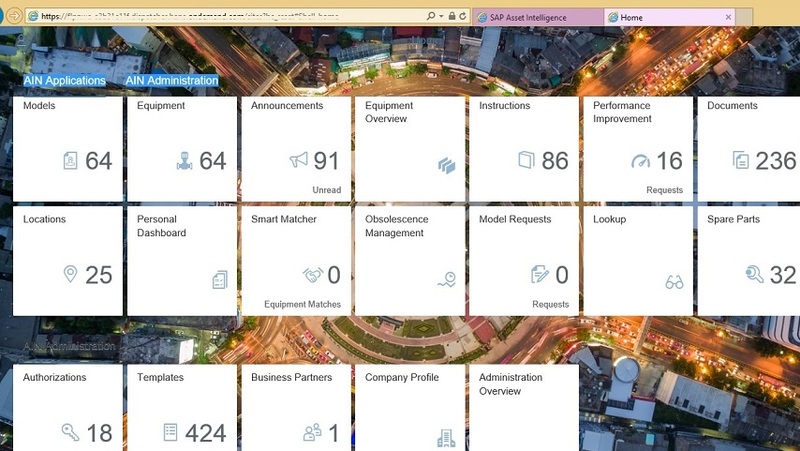 So what you see below is SAP Asset Intelligence Network, as it runs on SAP Cloud Platform, it’s a browser-based solution, so the only thing you need is a browser in order to access SAP AIN. You can see quite a lot of “tiles”, or applications, like Models, Equipment, Announcements, etc. We can either go through the announcements, instructions, etc of a specific equipment or can view altogether by directly navigating through the respective tiles in home screen. List of documents associated with equipments. We have selected the equipment ‘Centrifuge Pump CP Hi-Flow 2 HP’ and the application has displayed its details. 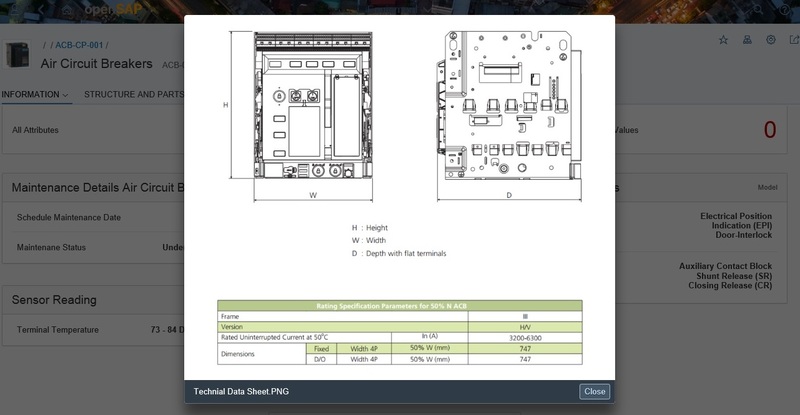 The main menu consists of Information, Structure and Spare parts, Documentation, Monitoring and Timeline. The Information menu has Highlights, Attributes, Model Information, Installation Information, Installation Location, Life Cycle Information, and Groups. Next menu is the Structure and Spare parts. We can perform a 3D disassembling and walkthrough through the equipment’s spare parts. And in Documentation menu, we have Documents, Instruction and Announcements. Monitoring menu has Measuring Points, Error codes and Improvement requests. Next Are you a UK multinational company with HR data in Success Factors…? Then you’d better read this.